They say inventions derive as a result of a necessity. They say inventions derive as a result of a necessity. Same is true for the BowdupLoader™. I started hunting at the age of 41 and now at 47 I have already realized the challenges faced after years of heavy lifting and ignoring the strain put on my back. After a successful hunt in 2012 with my wife’s Uncle Dave I bagged my second buck. The loading process resulted in a backflip off his atv and landing face down. It was at that point I realized something was needed to take the “Strain out of loading Game”. Uncle Dave often hunts alone and requires assistance for loading. I returned home and began looking for something that would assist in loading the game on Uncle Dave’s Polaris Ranger and could not find anything that would resolve the strain problem. Looking over the Ranger design I realized the solution….. “The BowdupLoader™”. minimal skills to mount. 45 minutes 1st install(model dependent), 5 seconds thereafter. Ability to handle 350 lbs. (restraint cable required due to vehicle limitations -included). The first loader was field tested in Missouri by Uncle Dave with all positive results. I had the opportunity to take my daughter to Missouri for the year-end youth hunt weekend. My daughter and I got the opportunity to test the loader ourselves when she bagged her first buck at 14 yrs. old. Proud daddy didn’t have to ruin the moment by overexerting the old back to load her trophy, the BowdupLoader™ handled it effortlessly. 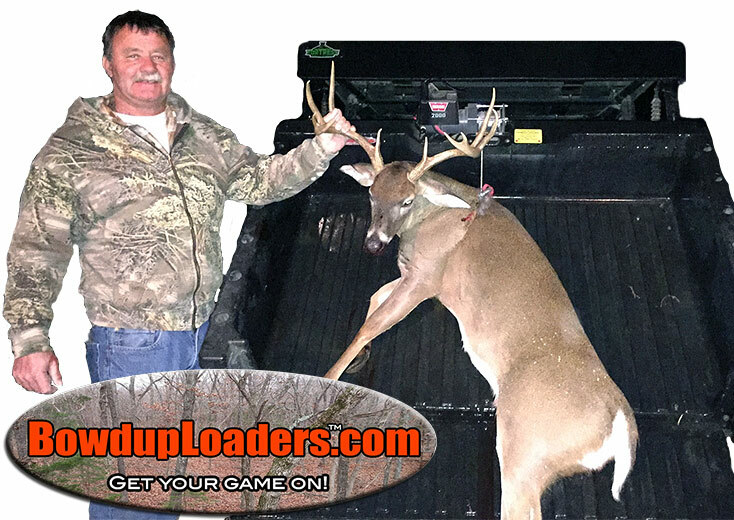 Please take a moment to visit BowdupLoaders.com™ to see it in action and give it consideration for your UTV loading needs around your property as well as in your hunting pursuits. Don’t forget to tell a friend about us.